Escalators are a form of vertical building transportation designed as a staircase that moves with the assistance of a motor-driven mechanism. Escalators are used to connect floors with an angle of rise between 30°-35°. The entire length of an escalator must also provide enough space for a lower zone of mechanical equipment along with a structural truss that averages around 3’8” | 1.12 m deep. Both ends of an escalator require structural supports and may also require intermediate supports depending on the length of the run. 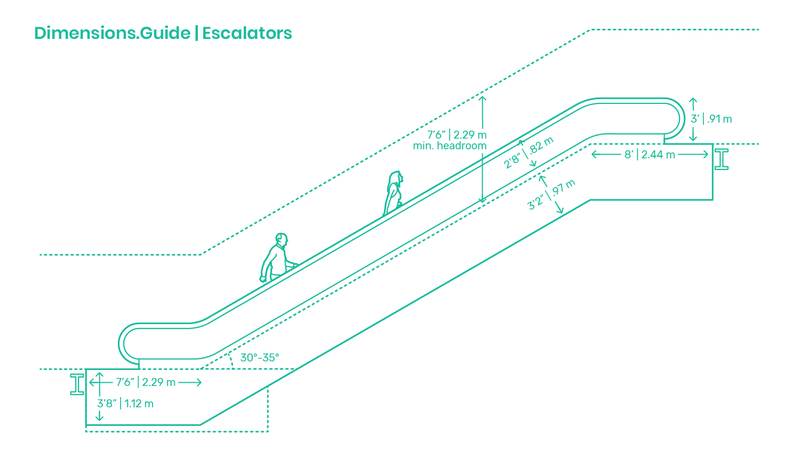 For the safety of users, escalators must incorporate 3’ | .91 m handrails and preserve a minimum vertical headroom clearance of 7’6” | 2.29 m. Adequate space should be provided at each loading or discharge platform of an escalator for easy queuing and waiting at peak hours—typically 7’6” | 2.29 m at the bottom and 8’ | 2.44 m at the top. Escalators cannot be used to meet building requirements for fire exits. When specifying an escalator installation, consult directly with the manufacturer for accurate sizes, capacity calculations, speeds, and structural requirements.